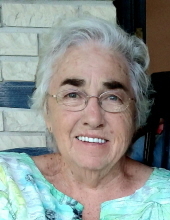 Wanda Joyce Faulkner Lake, age 78 of Corbin, Ky., passed away Tuesday, April 2, 2019 at her home. She was born August 18, 1940 in Whitley County, Ky. to the late Charlie Everett and Laura Victoria Mayne Faulkner. She was also preceded in death by her husband Denver Lake, 1 brother; Charles Faulkner, 2 sisters; Francis Poff and Lorraine Pruitt, 1 brother-in-law; Pete Lake. She is survived by 1 daughter; Penney Denese Lake of Corbin, Ky., 1 son; Scott Lake (Angila) of Corbin, Ky., 3 grandchildren; Lauren Cloud (Justin), Victoria Watkins, Isabella Faith Lake; 3 great grandchildren; Adelyn Cloud, Allyson Cloud, Olivia Gillespie, 1 brother; Wade Faulkner of Williamsburg, Ky., 1 brother-in-law; Wilburn Lake (Carolyn) of Goldens Creek Community, 1 sister-in-law; LoDean Lake of Corbin, Ky., several nieces, nephews, and a host of relatives and friends to mourn her passing. Funeral service will be 1:00 PM Saturday, April 6, 2019 at the Locust Grove Baptist Church with Rev. Larry Carte and Rev. Randy Douglas officiating. Interment will be in the Faulkner & Mayne Cemetery. Visitation will be 6:00 PM Friday, April 5, 2019 at Ellison Funeral Home. 11:00 AM – 1:00 PM Saturday, April 6, 2019 at the Locust Grove Baptist Church. To send flowers or a remembrance gift to the family of Wanda Joyce Faulkner Lake, please visit our Tribute Store. "Email Address" would like to share the life celebration of Wanda Joyce Faulkner Lake. Click on the "link" to go to share a favorite memory or leave a condolence message for the family.